www.alexandervolkovfineart.com is committed to respecting your privacy. We have created this privacy statement in order to demonstrate our commitment to our customers. We will never give any information about you to others without your express permission unless we are required to do so by law. The only exception to this rule is in the case of legitimate service providers (see more below) such as our email/newsletter service provider. This site also contains links to other sites. 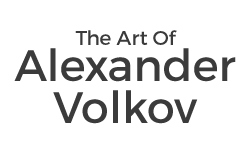 Alexandervolkovfineart.com is not responsible for the privacy practices or the content of such web sites.